The Old Town Ridge site is located in northern Craighead County, Arkansas. Recognized historically for more than a century, the ca. A.D. 1350 site was formally recorded in 1967 by Mr. R.W. Lyerly, Jr. The site is known to contain houses and numerous ceramic and lithic artifacts, including a ceremonial mace discovered in 1925 and a spectacular gorget displaying elements rooted in Braden and Craig-style iconography associated with the Southeastern Ceremonialism of the Mississippi Period, which links geographically-distant sites such as Cahokia (Illinois), Spiro (Oklahoma), Etowah (Georgia), and Moundville (Alabama). Old Town Ridge and the Northeast Arkansas vicinity. CLICK TO ENLARGE. Prior to the geophysical fieldwork, aerial photographs were examined, resulting in interpretations of potential site boundaries and interior features. Horizontal striations visible in the photo above are east-west trending cotton furroughs. 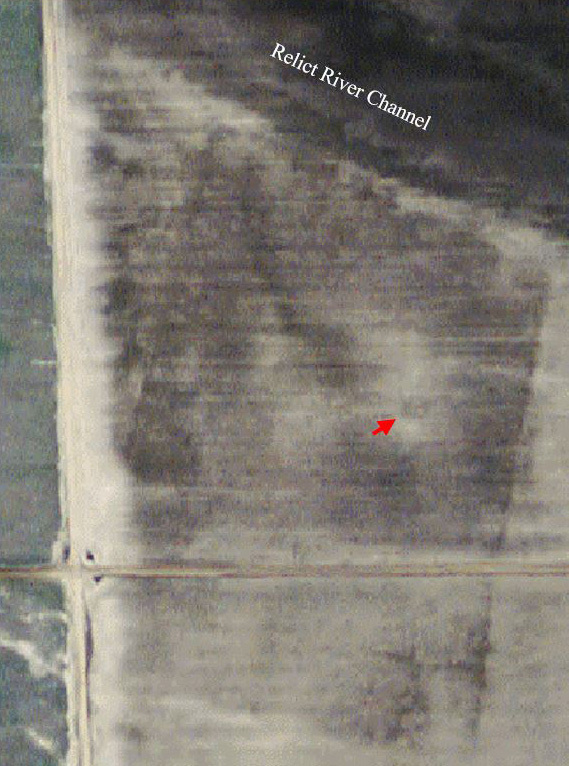 The red arrow marks a large rectangular anomaly that is visible from the air and in the gradiometer data at right. Looking beyond surficial artifact discovery, objectives of the project were to locate the corners of bounding earthworks and other internal site features as initially interpreted from aerial photography. Onsite, centimeter-level spatial precision was achieved by establishing a permanent grid system using a total station. Most of the 18-acre fortified site has now been surveyed using a fluxgate gradiometer to identify and locate structures and other archeological features for use in ongoing research examining intrasite organization and Middle-to-Late Mississippian Period life ways in the region. 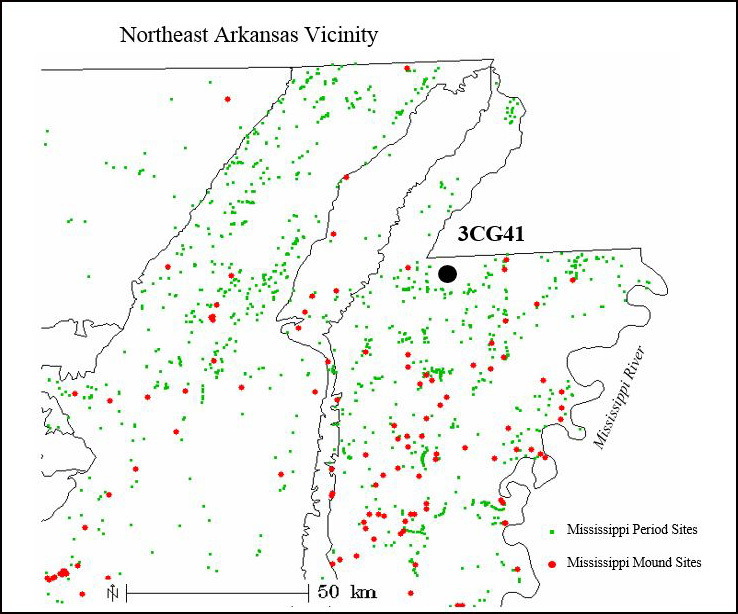 Results indicate a fortification ditch, palisade, numerous structures (large and small, burned and unburned), and earthquake features from the New Madrid or earlier, possibly-contemporaneous quakes. The study also compares areas of the site that have been land-leveled for agriculture with areas that have been less disturbed. 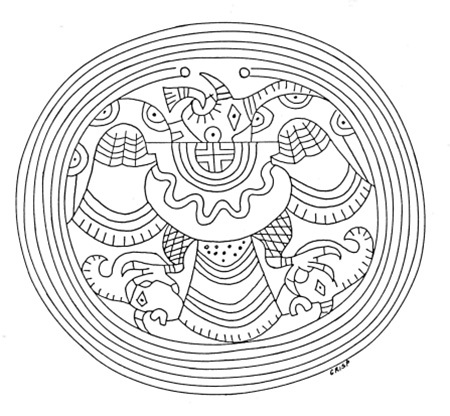 Depiction of an engraved “birdman” gorget said to have been found at 3CG41. 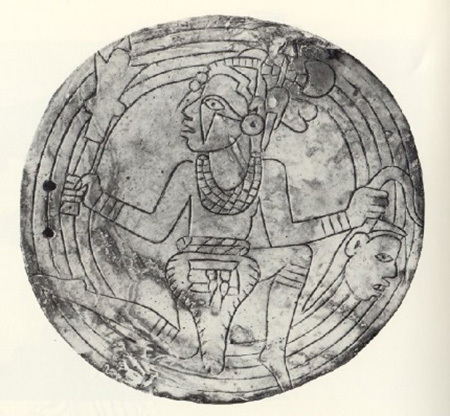 Stylistically, the gorget suggests long-distance trade and communication with Spiroan and other contemporaneous cultures. Above is a photo of a Braden-style engraved gorget that is more realistically rendered, but portrays similar symbolism and design elements. (Castalian Springs site, Sumner County, Tennessee). Also found at 3CG41, a mace similar to those found at Spiro may signify power, prestige, and the presence of high status aristocrats. 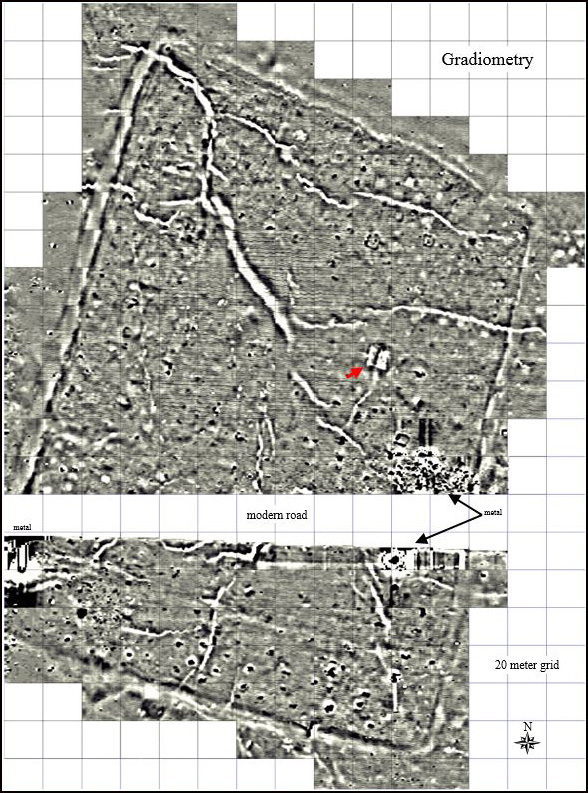 An enlargement of the gradiometry for the northeastern portion of the site (above) shows numerous anomalies that are consistent with prehistoric structures and other burned and unburned archeological features. 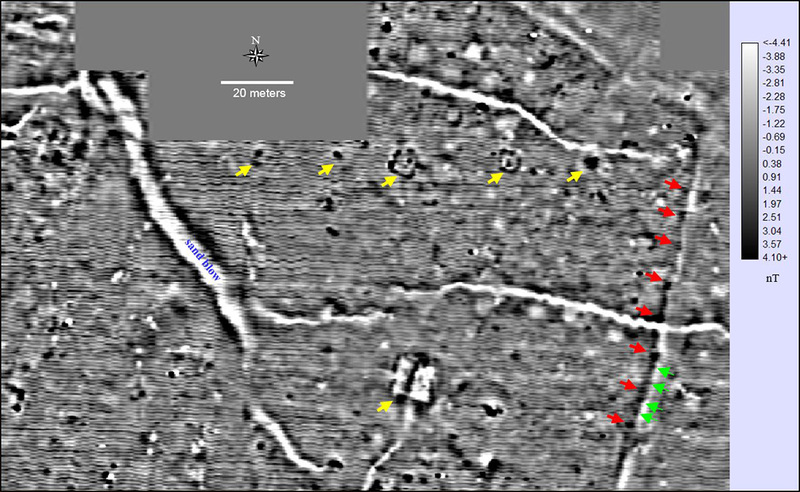 Some examples of probable structures are marked with yellow arrows, and many other similar structure-like anomalies can be seen. The largest of these is approximately 15 meters on a side. Smaller magnetic anomalies may indicate hearths or pits of various types. Red arrows mark the fortification earthworks at small, evenly-spaced, round magnetic monopoles that may be sizable posts/post molds. Smaller green arrows mark possible interstitial posts. The irregular, linear, white areas of decreased magnetism are earthquake liquefaction features (sand blows). Assorted surface artifacts from 3CG41. Thanks to Dr. Thomas J. Green, Dr. George Sabo III, and Arkansas Archeological Society members Russell Henry and Melinda Martin. Morse, Dan F., Phyllis Morse. 1983. 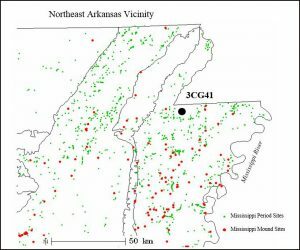 Archaeology of the Central Mississippi Valley (New World Archaeological Record). Academic Press, Inc. San Diego, CA.